In this post I’m going to bring together a couple of my previous posts that discuss retrieving and saving images, and retrieving a Shared Access Signature from a controller which will allow me to write to a particular container within Blob Storage. To complete the implementation I’ll use the Windows Azure Storage library from NuGet – it only installs for Windows platforms as there’s no PCKL or Xamarin support for this library currently. As the Windows Azure Storage library is current platform specific, I’ll need to wrap it in a simple interface that makes it easy for me to write data to Blob Storage – I’ll come back to that. For the time being I’m just going to retrieve the SAS and use it along with the storage library to upload an image. So I’ll start by invoking the sharedaccesssignature controller using the GET verb as I want to ensure the container is created if it doesn’t already exist. This will return a SAS which I can use in the upload process. Next I want to capture an image, in this case picking a photo, and uploading it to a specified blobg. // and extract the storage credentials. // Instantiate a Blob store container based on the info in the returned item. Clearly this code isn’t well factored but it’s here as a quick example of how you can use a SAS to upload content to blob storage. In my post Storing the Big Stuff in Blob Storage I showed you how to manually create a shared access signature. 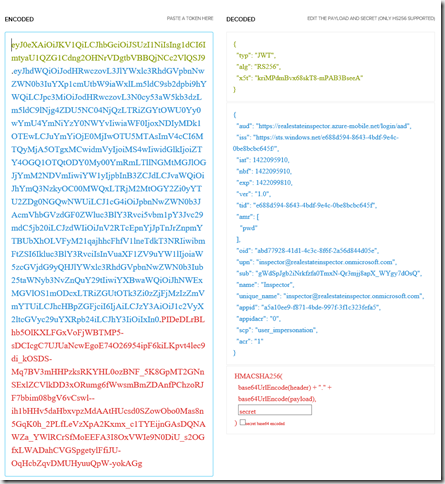 The Azure Mobile Services team have done a really nice job of making this even easier with the ResourceBroker NuGet package. Getting started documentation is available via GitHub (https://github.com/Azure/azure-mobile-services-resourcebroker) and of course the package, which I’ve added to my Mobile Service project, is available via NuGet. // Create a custom route mapping the resource type into the URI. // Insert the ResourcesController route at the top of the collection to avoid conflicting with predefined routes. - Initially I removed the contents of my controller but then I realised that there are limitations on the ResourceControllerBase (eg the Blob container must exist and that I needed to specify an actual blob, not just a container for access), so I kept my code and modified it to work with the new connection string. Don’t forget that if during debugging you set authenticationlevel to anonymous, to make sure you change it back to User or Application before publishing. Once added you’ll see the component listed in Solution Explorer under the Components node. However, the Components, like NuGet packages, are located at a solution level. This makes them easy to reference from other projects. 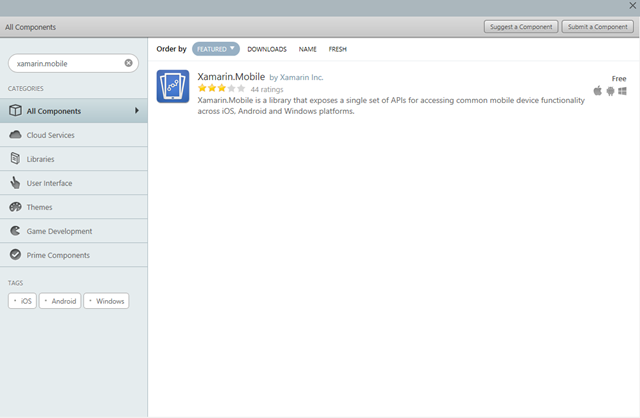 In this case the Xamarin.Mobile component can be referenced by our Universal, Windows Phone 8.0, iOS and Android projects. This will make performing operations such as selecting or capturing photos much easier. However, be aware that there are some APIs that aren’t supported across all platforms. For example whilst you can reference the component from the WP8.1 application, MediaPicker fails as it’s not supported. 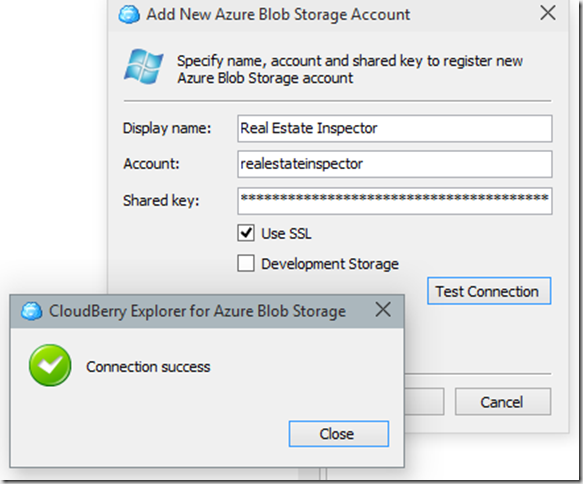 Before I can get onto using the SharedAccessSignature to upload content to Blob storage I first need to generate and save content. As this relies on platform specific implementations of capturing images from the camera and then accessing the file system. I’ll start with the latter and I’ll use a NuGet package called PCLStorage which has implementations for all the platforms I’m interested in. 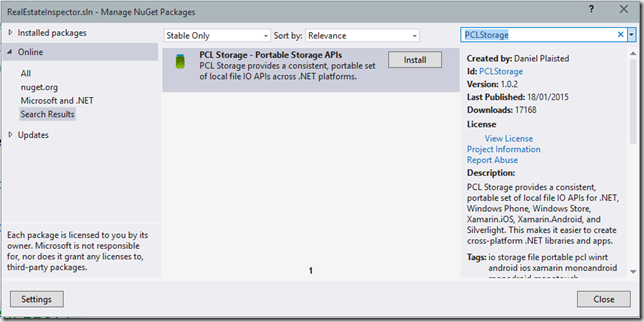 From NuGet I locate the PCLStorage package and install it into the client applications. The FileText property can be databound to a TextBox in the XAML based projects allowing for user input which will be persisted between application instances. The actual location of the file is platform specific, for example on WPF this file is located at C:\Users\Nick\AppData\Local\RealEstateInspector\RealEstateInspector.Desktop\1.0.0.0\test.txt which is local data specific to both user and application. PCLStorage also defines a roaming storage option which again will be dependent on the platform implementation. 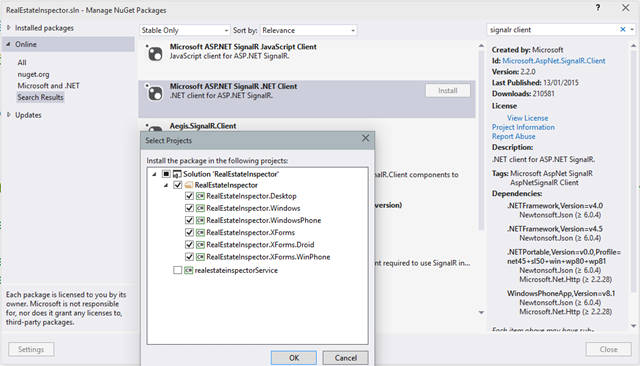 In a previous post I showed how to use SignalR as one option for providing feedback to the client application during a long running service operation. However, I didn’t display this on the UI because that would have made the blog post long and complicated as I tried to explain propagating a change from a non-UI thread, back onto the UI thread so it could be displayed within the app. In this post I’m going to do just that – what’s interesting is that each platform handles this scenario slightly different with some caring about thread affinity, whilst others do not. Note that as this property changes it calls the OnPropertyChanged method which will be used to raise the PropertyChanged event specified in the INotifyPropertyChanged interface – this is what the XAML data binding framework uses to detect when bound properties are changed. In this case I’m going to implement this interface in BaseViewModel, and have MainViewModel inherit from BaseViewModel, rather than implement it in every view model. And this needs to be registered with Autofac in the ClientApplicationCore – note the use of the NETFX_CORE compilation attribute. This issue isn’t specific to Universal applications, and you should always make sure you have access to the UI thread when making UI changes (such as updating data bound properties). There are numerous frameworks out there that provide mechanisms for instantiating view models. Long again, when I first started building XAML based applications and became familiar with MVVM, I stepped through a number of different ways of creating and wiring up view models. In this post I’m going to show a very basic implementation of a locator to instantiate view models. Into the Core library I will add a ViewModelLocator class which exposes a property, Main, that will return a new instance of the MainViewModel. I’m going to want a single instance of this class to be created and kept around for the duration of my application’s lifecycle. One option would be to instantiate it within my ApplicationCore class I introduced previously. However, I actually want the instance of the ViewModelLocator to be accessible via XAML, so for this reason it makes more sense to instantiate it as a XAML resource. 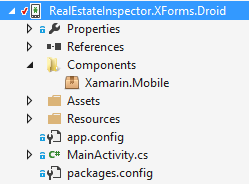 In the WPF and Universal (Win/WP8.1) applications I can simply add this to the app.xaml file to the Application.Resource element. There seems to be a quirk in XForms at the moment in that the Binding expression calls to the Main property repeatedly – since it gets a different instance of the MainViewModel back each time, it ends up in an endless loop trying to get a consistent value. To prevent this, we can add a view model dictionary to the ViewModelLocator and change the behaviour to always return the same instance of the view model. And there you have it – view model location across all applications. At this point I’m starting to think about “real application” problems such as how services/components/view models are located and how navigation between view models is going to work. For anyone following this series of posts I currently have Universal (Windows/Windows Phone), Xamarin Forms (iOS (broken), Android and Windows Phone 8.0) and WPF clients. So far I’ve been covering how to handle accessing data (Mobile Services) and authentication (Azure Active Directory) and to a lesser degree data binding (XAML, Data binding and View Models) but I haven’t looked at how the client applications are going to be architected. There are some core issues which need to be solved in a general way so that it will work across all client applications, such as how view models are located (created and supplied to corresponding view) and how navigation can be triggered within a view model that will correlate to a page/view change in the UI layer. This issue I’ll leave to another day as it generally involves either picking an existing framework (MvvmCross, Mvvmlight etc) or rolling your own – and I’m still undecided on what to do. What I do know is that in order to refactor my SignalR implementation, which is currently done within the WPF Window codebehind, so that it will work on all platforms I’m going to need to define a set of interfaces in the Core library (PCL) which is implemented by each platform. I should be able to reuse the same code on all platforms for the implementation so the code can go into the Shared.Client project – it just needs to reference the platform specific implementation of SignalR. Before we get onto the refactoring, I’m going to add a couple of NuGet packages which will give use an IoC that we can call on to resolve dependencies. I was initially going to jump forward and include MvvmLight but I went looking for the navigation support and was a little disappointed – I’ll come back and do a full evaluation when I get to dealing with navigation but for now I’ve opted to go for Autofac. However, just in case I want to change IoC provider at a later stage I’ve also opted to include the CommonServiceLocator so as to provide a bit of an abstraction from any given library when it comes to resolving dependencies. And that’s it – this should work without modification on each of the client platforms…. I’ve been thinking a little more about alternative mechanisms for sending feedback to the client applications when a long running mobile service call is executing. 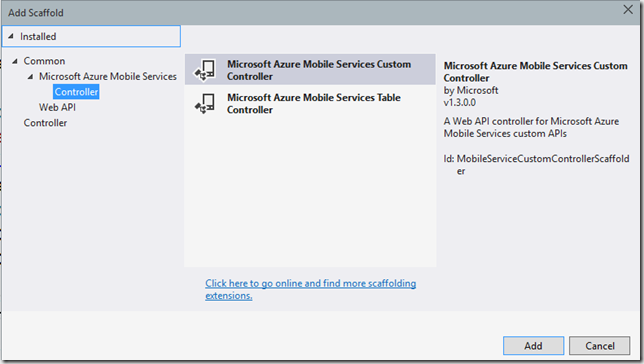 In my previous post on Long Running Custom API Calls in Azure Mobile Service I discussed returning immediately to the client application whilst continuing to process a long running task. Unfortunately this means there is no way to provide feedback. 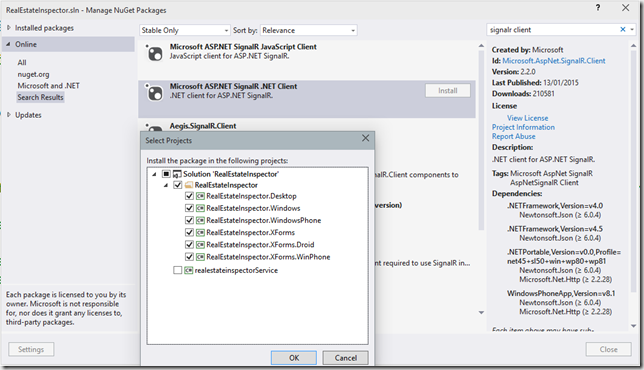 In this post I’m going to add in SignalR to provide that real time communications link. I’ll define a class that in herits from Hub and exposes a Services property – this will be populated automatically by the Mobile Service. 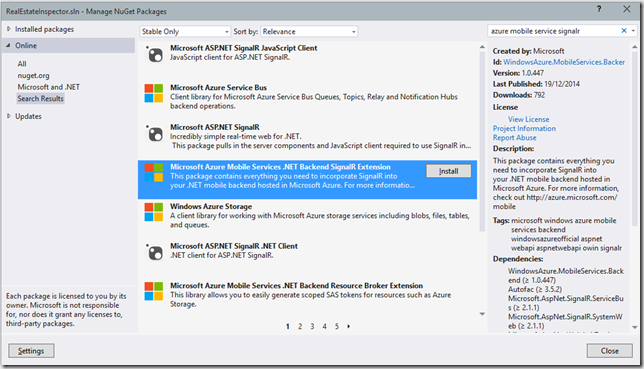 Next I’ll amend the Get service method to a) take a parameter (which is the connection id of signalr on the client) and b) provide feedback during the long running task via the hub object. Note the use of the dynamic Progress method which will correlate to the client side proxy method that it subscribes to. // Don't bubble the exception - do something sensible here! And then add a ConnectToSignalR method to establish the hub connection and return a connectionId, which will then be passed into the view model via the GenerateReport method. When this is run and the GenerateReport method is invoked, the current percentage complete is passed back to the client and appears in the handler for the Progress message. I haven’t shown any client side code for the timebeing because it remains the same (although it won’t timeout now!). The next step is to provide some way that the client can check on the progress of the work item. The full scenario is that we have a task that needs to be performed by the Mobile Service that might take a while to complete. The first step is to define a custom api which will invoke the task (alternatively you could hijack a table controller to launch the task as part of one of the CRUD actions) and to have this called from the client applications. However, this alone is not sufficient for long running tasks as the call to the service may timeout before the task completes. I’ll come back to that in a future post but for now, let’s look at creating a custom api. 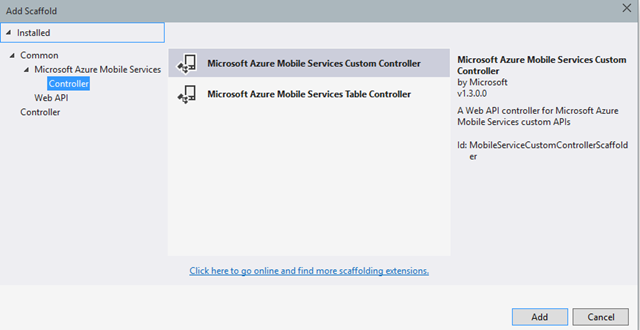 The first step is to add a new controller based on the Microsoft Azure Mobile Services Custom Controller template. Easy done – a simple api that we can invoke within our Mobile Service to do work. Note that in this case it’s a Get requrest with no parameters and a simple string return type. We can adjust this to be a Post, accept parameters and return a complex object by adjusting both the controller method definition (ie change Get to Post, or even just add a Post method) and invokeapiasync call. Whenever you do offline sync, there is a risk of conflicts emerging between client and server updates. Of course the data architecture should be done to minimise this (eg guid based primary keys) but this won’t always eliminate the issue. One example of where this might happen is if the client gets cut off midway through pushing changes to the server. For example if I were to insert a new record on the client, push the changes but before the changes had been confirmed back to the client, the network connection was terminated. The server now has the new record but the client thinks it still needs to send the record – when it does, a conflict arises where both server and client have records with the same primary key. Let’s replicate this and then look at solving it. Address = "New Random Property"
Run this, and insert a breakpoint after the InsertAsync but before the PushAsync. At this point inspect the prop object and retrieve the Id. Next, using either Sql Server Management Studio or Visual Studio 2015, connect to the SQL Server instance and run the following query (replacing the Id with the one retrieved in previous step). Now, if I let the PushAsync continue it will fail, causing an exception to be raised. In my previous post I controlled access to the GetAll method on my base controller by determining whether the authenticated (from AAD) user was a member of the Inspectors AAD group. This is actually quite a slow process and not something you really want to do every session. Ideally I’d like this check to be done once when the user authenticates against the mobile service (which happens after they authenticate against AAD) and for the IsInspector claim to be added to the user identity. Unfortunately for the life of me I can’t work out how to force OWIN into accepting an additional claim – I’m sure there’s a way, but I ended up settling for an alternative approach. As you can see this follows roughly the same logic for querying AAD group membership. However, this time I’m adding a cookie based on whether the user is an Inspector or not.This attribute can now be applied to the RealEstateBaseTableController. 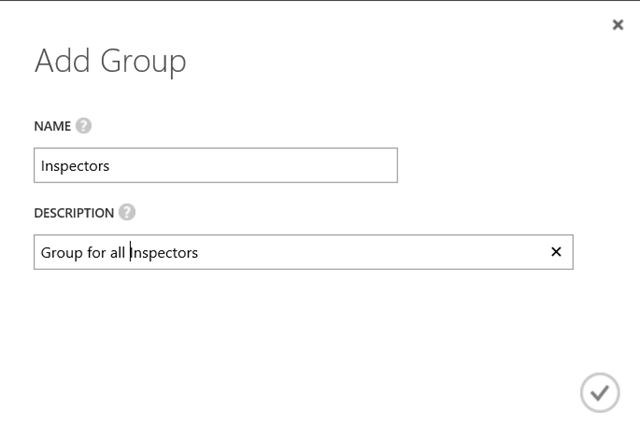 After getting local debugging to work with my Azure AD protected Mobile Service I’m now ready to start querying Azure Active Directory for information about the authenticated user, which can then be used to control what data is returned (being a better approach than allowing the client to determine what information it queries for). However, this turned out to be slightly harder than I thought it would be. 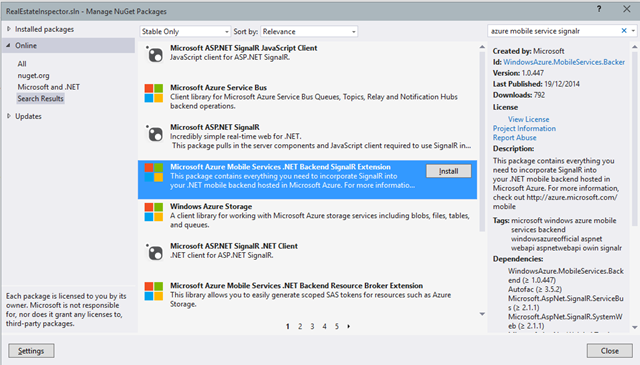 Having taken a look at various blogs/articles that talk about accessing AAD they all referred to the Graph API and there’s a NuGet package that can easily be installed into my service project which will make it easy for me to access the various aspects of AAD. 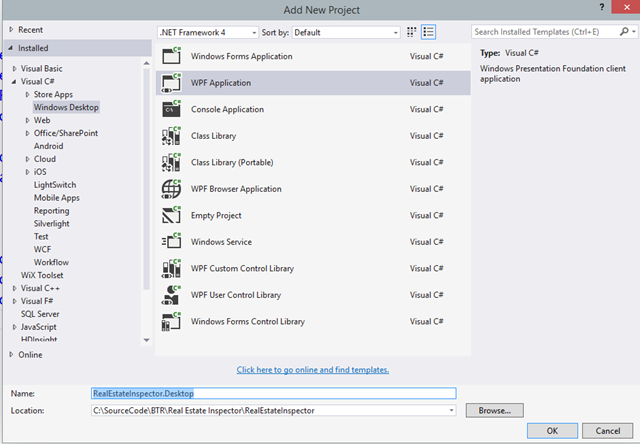 After installing this NuGet package when you run the Mobile Service project you may experience an error where it can’t resolve certain assemblies. To resolve this issue, look in the web.config file and ensure the assemblyBinding section has been correctly updated to point to the version of assemblies referenced by the Mobile Service project, and ensure there are no duplicates. Now, my initial assumption was that I could simply pass in the access token that I can extract from the claims passed into the Mobile Service. This isn’t the case but should you need this information, it can easily be retrieved by accessing the User property that’s made available within the base TableController class. Of course, what I was trying to do would never work, since the claims I have in my access token are for the Mobile Service endpoint, not for Azure Active Directory (even though AAD authenticated the user). 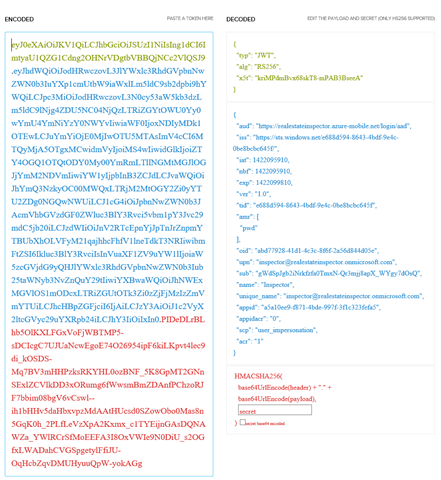 What I need to do is to request an access token with the AAD Graph API as the resource that I’m requesting access to. Luckily I don’t need to go through the whole authentication process, as I can use the RefreshToken that was returned along with the initial access token to request a different access token with permission to access a different resource. But first, I need to go into the Native Client application in AAD and give it permissions to access Windows Azure Active Directory. This might seem a little counter intuitive since we’re going to be accessing AAD from within the Mobile Service but if you think about the access token that will be used, it was issued via the native client application within AAD, so it’s here that we need to control the permission set. In the next post we’ll take this a step further an use this knowledge to control what the user can access. 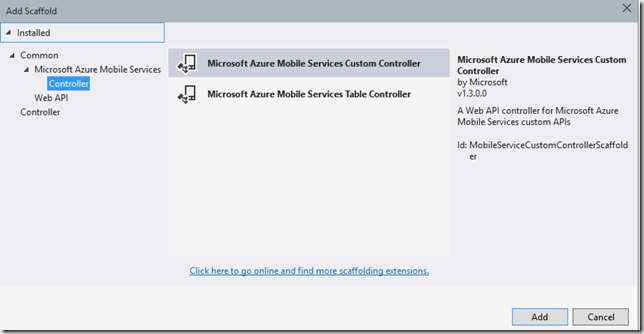 In a recent project one of the more challenging things was to debug the Azure Mobile Services (AMS) when running locally. For the most part it was pretty straight forward as a lot of the requests, whilst they required a user to be authenticated, the returned data wasn’t contingent on who the user was. When you run Azure Mobile Services locally, which you can with the .NET backend but not with the Node.js backend, by default it doesn’t enforce any of the security requirements. 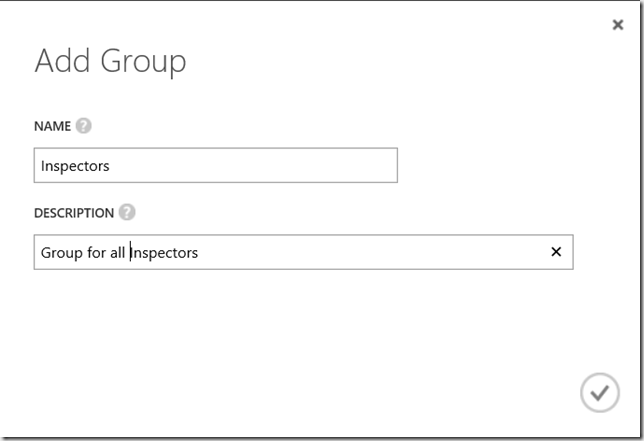 This makes it easy to debug scenarios where it doesn’t matter who the user is but very hard for those scenarios where the data needs to be altered based on who the user is, particularly if the user is being authenticated using Azure Active Directory (AAD). In this post I’ll walk through getting debugging to run locally. // localhost are permitted without authentication despite the AuthorizeLevel setting. In the native application, in this case my WPF application, I changed both the resource url for the AAD authentication and the mobile services url to use http://localhost:51539/ ie http://localhost:51539/login/aad for the resource url and just http://localhost:51539/ for the mobile services url. This seemed to work correctly initially as it displayed the sign in prompt, I could sign in and get back an AAD access token. Unfortunately when this was passed to the AMS it failed miserably with an unauthorised exception. Note: I actually feel what I did here was correct that that the Mobile Services team are incorrectly validating the claims based on the illusion that the local services is being hosted in the cloud. 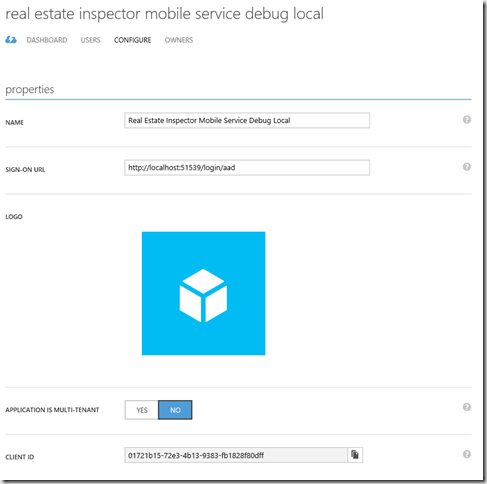 This means you actually need to authenticate with AAD as if you were requesting access to the resource https://realestateinspector.azure-mobile.net/login/aad and then actually connect to the locally running mobile service. Note that I’ve used an inline compilation constant to allow me to switch from debugging against the local services versus those hosted in the cloud. 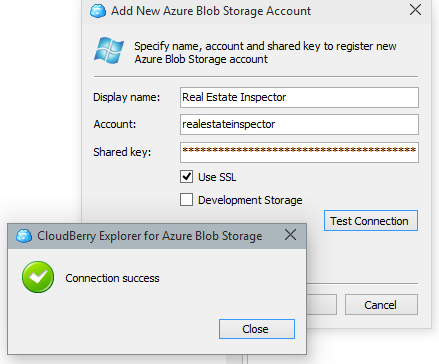 If you attempt to run this, the user will be directed to authenticate using the AAD signin with a resource https://realestateinspector.azure-mobile.net/login/aad and then the application will attempt to login to the Mobile Service running locally at http://localhost:51539/ (Note – I typically set both the native client project (in this case the WPF application) and the Mobile Service project as start projects). However, you’ll still get an unauthorized exception because the Mobile Service actual does verify that the claims in the access token returned from AAD match the settings of the Mobile Services (excluding the base url that the service is being run from - see my early argument why this imho is the wrong approach). Let’s first take a look at the access token using the site http://jwt.io. If you look in the Web.config file for the Mobile service you’ll see that there is a list of Mobile Service settings in the appSettings section. 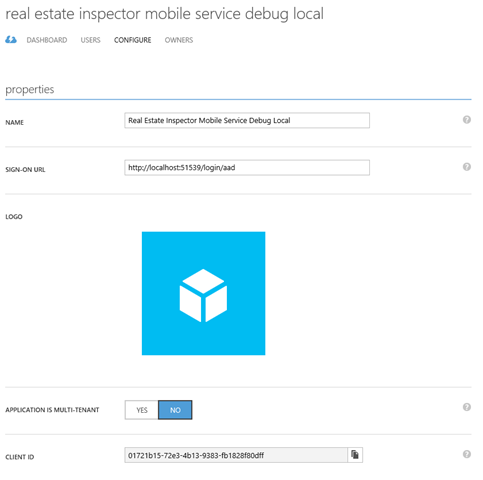 The first of which is typically the MS_MobileServiceName and I’m guessing it’s this setting that is being used to validate that the claim in the token is for the right mobile serivce – in the token you can see that the resource is https://realestateinspector.azure-mobile.net/login/aad where the only piece that varies between Mobile Services is the service name. With this in place, running the native application again and you can login, retrieve the AAD access token, and then when the mobile service client attempts to login it will do successfully. When you then make a call to one of the controllers, you can set a break point and access the User property to retrieve information about the current user and their claims. This image shows the AAD claim for this user. In my previous post I thought that there was an issue with using the Azure Active Directory Authentication Library (ADAL) and the updated Xamarin for iOS. This has been confirmed by the team at Microsoft responsible for ADAL with a view that it will be resolved in a future version (no specifics on which version or when). This is unfortunate as it means my iOS version will have to be put on hold for the timebeing. On a different note I saw a mention in the forums that apparently Xamarin.Forms 1.4 will support Windows Phone 8.1 (and I hope as part of a universal app, also supporting Windows 8.1). Of course, there’s no timing on this one but does pose the question as to whether I should wait for the next iteration of Xamarin.Forms before proceeding with the sample apps. For the timebeing I’ll continue and see how far I get. In today’s post I was going to cover adding Azure AD authentication to my iOS project but I don’t have my Mac build machine handy so there’s a bit of a change of plans. Today I’m going to add a WPF desktop application to my solution and catch it up to where the other client applications are up to. I’ll start by creating the WPF Application. 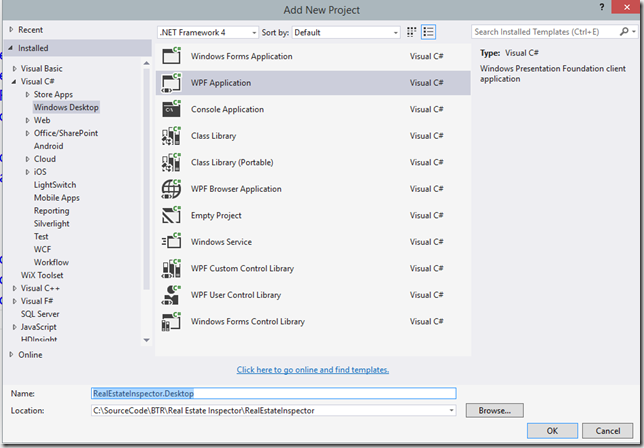 At this point I realised that I missed setting the framework in the Add New Project dialog, so I opened the Properties pane of the application and on the Application tab I set the Target framework to .Net Framework 4.5. 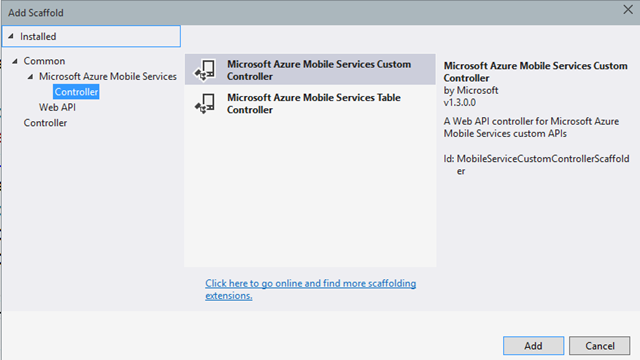 And then add reference to both the ADAL and Mobile Service SqliteStore packages. From the downloads page on sqlite.org you’ll also need to download the “32-bit DLL (x86) for SQLite” which is under the Precompiled Binaries for Windows heading. Unblock and Extract the zip file and add the sqlite3.dll file to the new WPF project, setting the Build Action to Content and setting the Copy to Output Directory to Copy always. I also need to check the Prefer 32-bit checkbox and define the DESKTOP compilation symbol for All Configurations. And that’s it, the WPF desktop application can be run up, the user can sign in and properties are synchronized before being displayed. 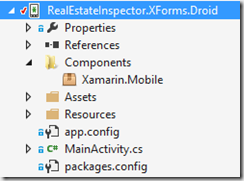 In my previous post I covered adding authentication to the Xamarin Forms Windows Phone 8.0 project. Next step, add it to the Android project. I figured this would be much simpler. However after adding a reference to ADAL from NuGet my Android project failed to build with some esoteric error about some missing layout xml in a referenced component. A quick internet search later I figured it might be due to the path lengths of my projects. I’d been relatively descriptive in my project names (eg RealEstateInspector.XForms.Droid) which had resulted in some very long paths, particularly during the build process where components are added based on the compilation path, the referenced library path and of course the file name. The upshot was that I needed to shorten not the project names, just the physical paths of the projects (easily done via VSO and Source Control Explorer within VS). At this point I also ran into an issue using my dummy redirect uri of http://tba.com, which is actually a real website and has an alternative mobile site which they redirect to. The issue was that after the user had authenticated the web view would redirect to http://tba.com but would then be redirected to the mobile site. I switched to using http://builttoroam.com which I know doesn’t have a redirect. Don’t forget when doing this you also have to update the redirect uri in the Native application in Azure Active Directory.